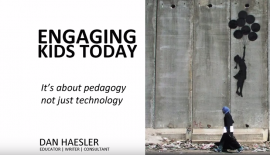 Dan Haesler is an international keynote speaker, educator, writer and consultant. Working with schools across the country around issues of engagement and wellbeing, he is passionate about equity in education and engaging our hardest-to-reach kids. In recent years Dan has developed a reputation as one of the Asia Pacific’s most dynamic educational thinkers and speakers.